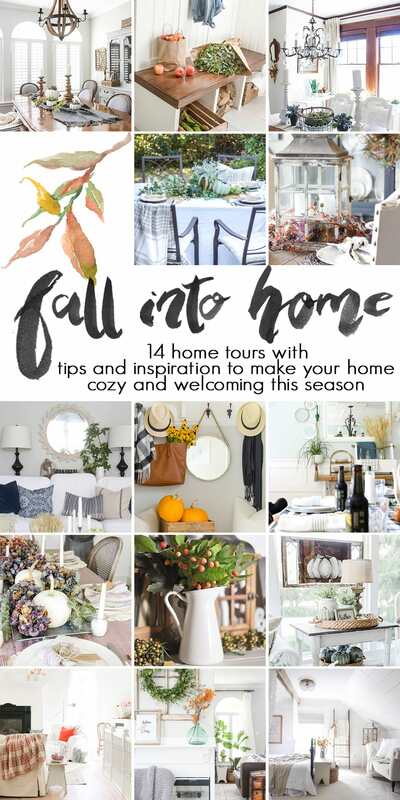 This year, I’m joining one of my best blog friends, Rachel from Maison de Pax, again in her Fall Into Home 2016 Tour along with 12 incredibly talented bloggers. If you’ve never been in my neck of the woods before, welcome! I’m so thrilled to have you over for a visit! 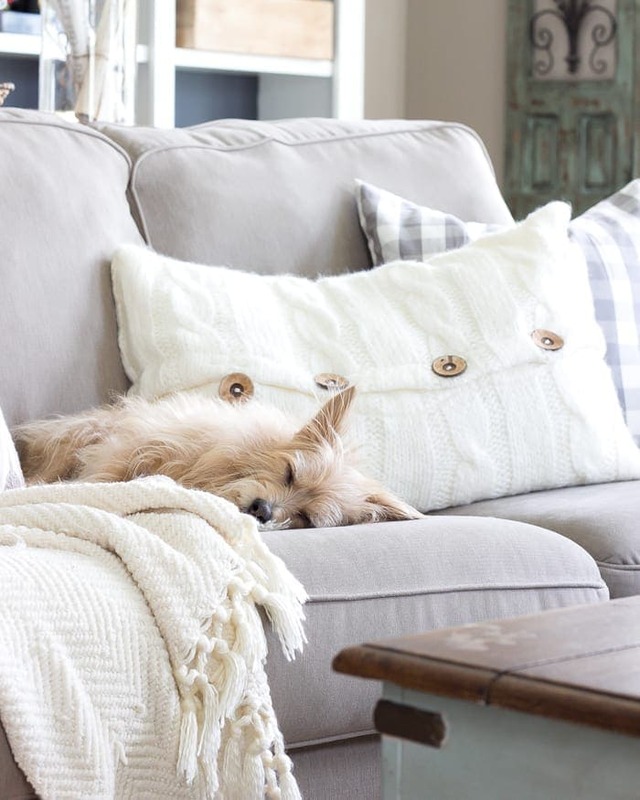 My hubby Robert, three year-old Olivia, spoiled pup Lola, and I have lived in this first home of ours in the suburbs of Charlotte for 2 1/2 years, and we’ve had tons of fun making this builder grade house an expression of our family. 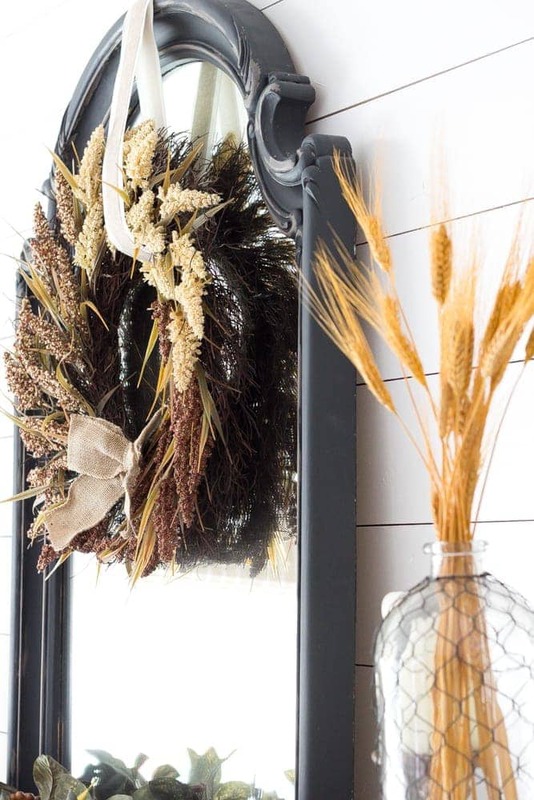 I already shared how I decked out our foyer for Halloween last week, but before going all bat-crazy in here, I swapped out my summer greenery for some gold leaves, metallic artichokes, and dried wheat stalks. 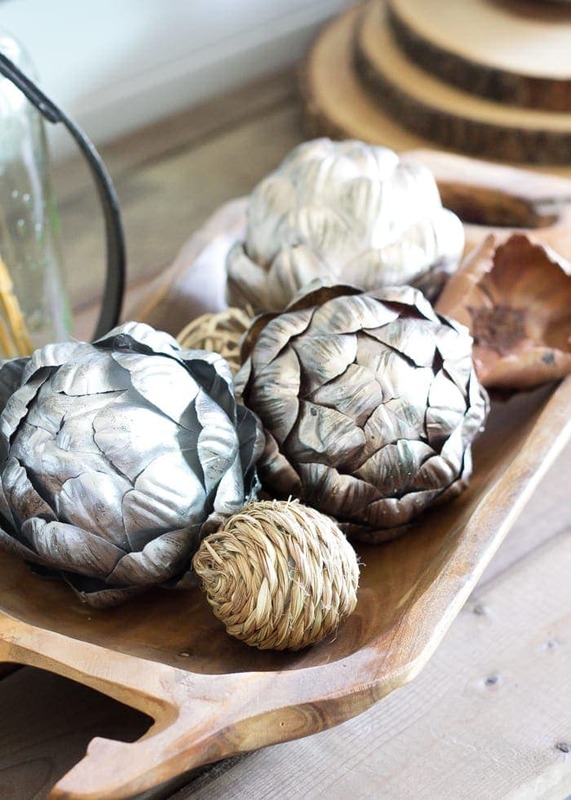 Choose neutrals as your base– wooden bowls, white pitchers, metal lanterns, glass vases, natural woven baskets. 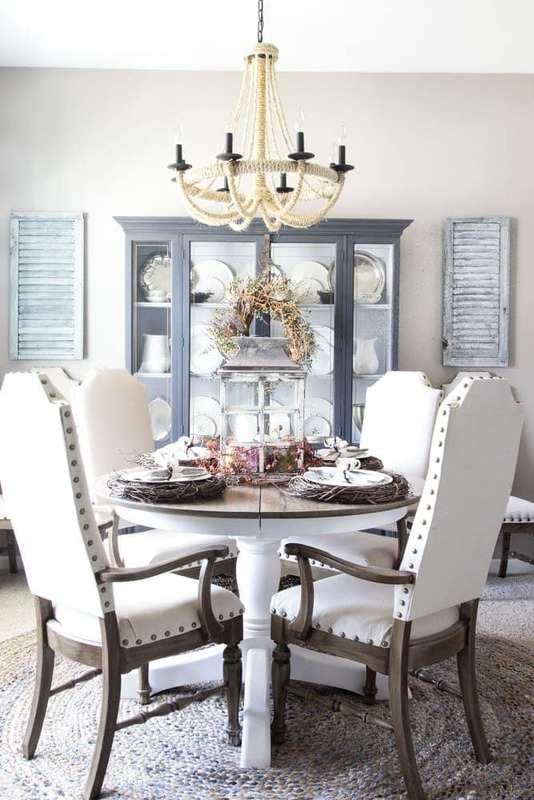 I love neutrals because they’re easy to add pops of colors to as the seasons change year-round. And you can buy those classic staples anywhere, especially in thrift stores. 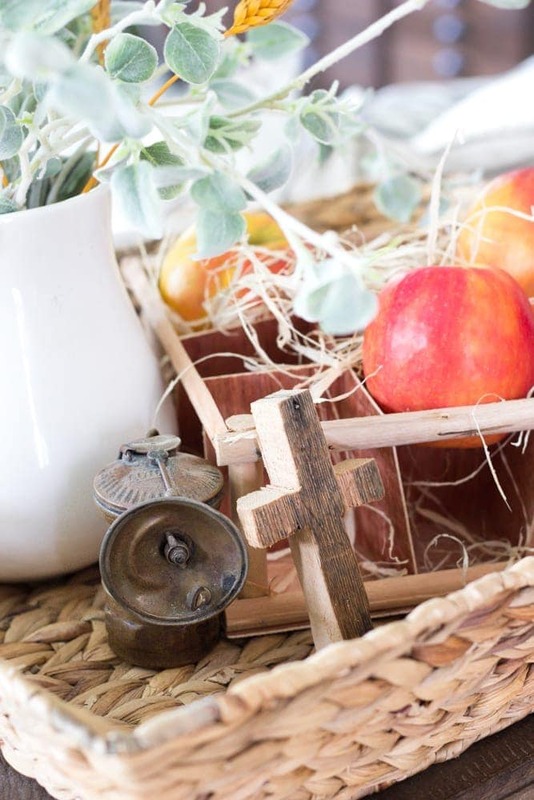 Even though I found this little wooden trough in the HomeGoods clearance aisle with a broken handle, I couldn’t stop myself from snatching it up. $5.00? Yes, please! 2. 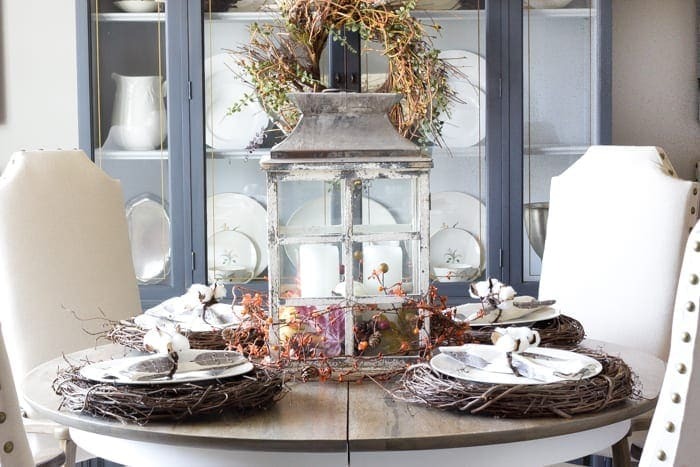 Choose faux florals instead of the real stuff to decorate inexpensively year after year. I love visiting Trader Joe’s whenever I can for real florals and pumpkins, but the reality is the real items from nature only last a few days or weeks if you’re lucky. 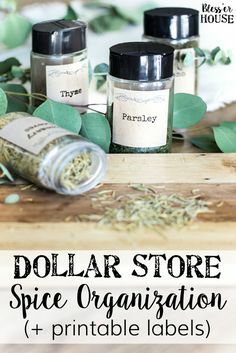 I like buying artificial bittersweet vines, leafy branches, and faux gourds and pumpkins from craft stores during 40-50% off sales in the late summer when they first hit shelves or on clearance after Thanksgiving to save for the next year. They end up paying for themselves in the long run. Because I mean, if you can’t decorate your table all fancy at Thanksgiving, when can you? I decided to play with our newly madeover dining table by repurposing some grapevine wreaths as chargers to add a little texture. 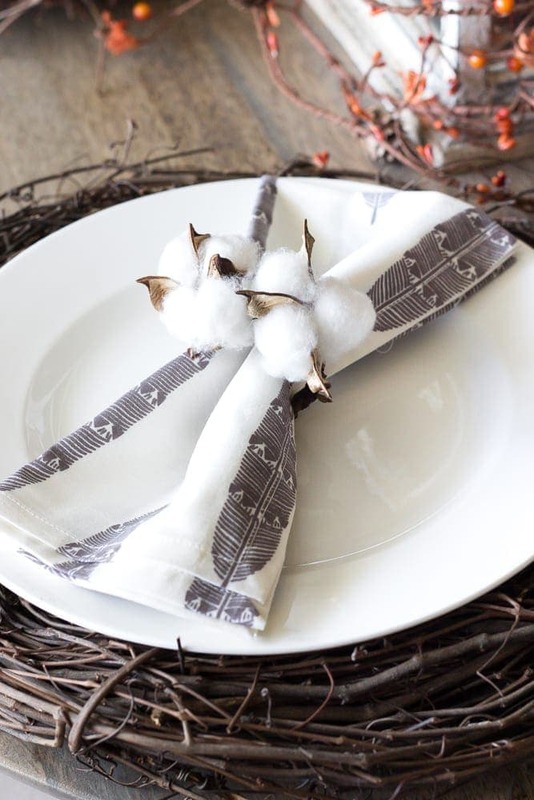 I went a little craft happy with these DIY cotton boll napkin rings that I’ll be sharing the tutorial about soon too. 3. Focus on a color palette. 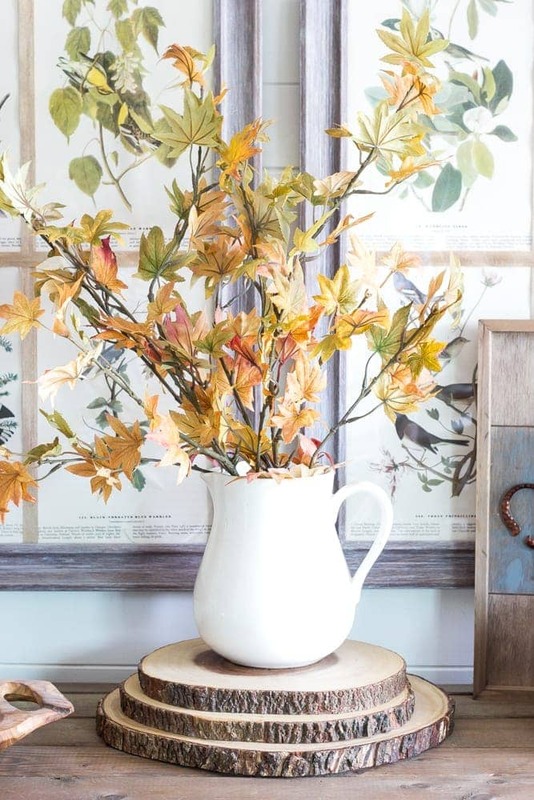 If I’m decorating a room for fall, I like to decide before I start if I want it to be vibrant or neutral. You can keep a certain color palette going throughout your entire house, but I like to mix it up from room to room sometimes. In our kitchen, I stuck mostly to golds and light greens. Ever since we finished our kitchen makeover a few months ago, I’ve had a lot of fun cooking new recipes in here. Robert and I just completed Whole 30, which I might be sharing the results of with y’all sometime. But basically, it’s like boot camp in your kitchen. 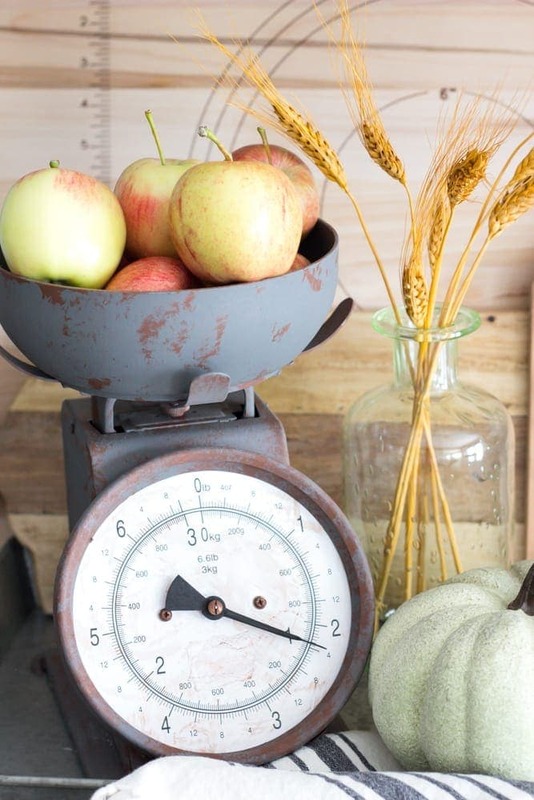 I loaded up my faux rusted “vintage” scale with a haul of apples from our nearby apple orchard. We love going apple picking every fall and stocking up on cider. If I don’t watch Olivia though, she’ll take one single bite out of every apple in the bunch. Toddler problems, am I right? Even though these branches are just the fake ones from Michaels, they make me eager for a trip to the mountains to see the changing leaves soon. It’s still a bit too early here in the Carolinas for the real stuff. 4. 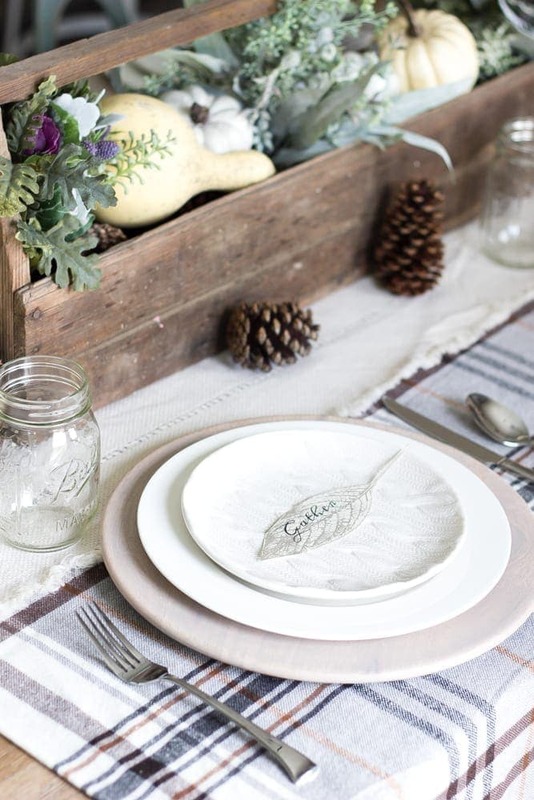 Add small details with place settings and centerpieces. 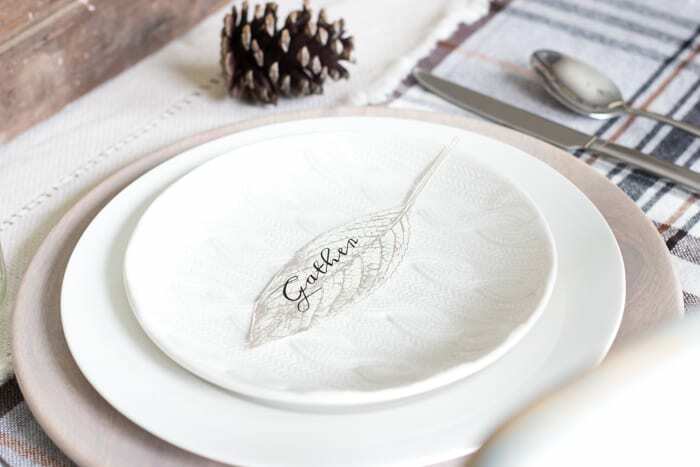 For past Thanksgivings, we’ve piled 24+ guests into our house for a giant feast, and one of my favorite things is decorating the tables to make them extra special. We’ll be in mid-playroom makeover by the time Thanksgiving rolls around, so I got out of it this year. Ha! 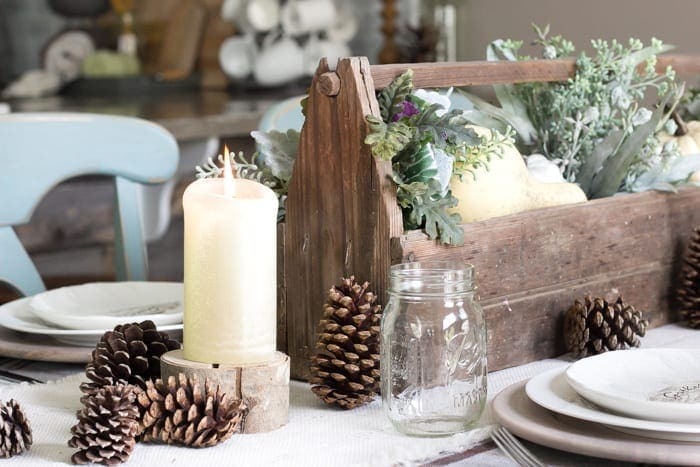 But I’ll probably still go table decor crazy at my parents’ house because it’s always what I look forward to… besides seeing family… and eating the food… and the desserts! My mom actually found this old toolbox for me at an antique store earlier this year. She knows me too well. Ever since she gave it to me, I’ve had fun filling it up with seasonal florals when we have company. 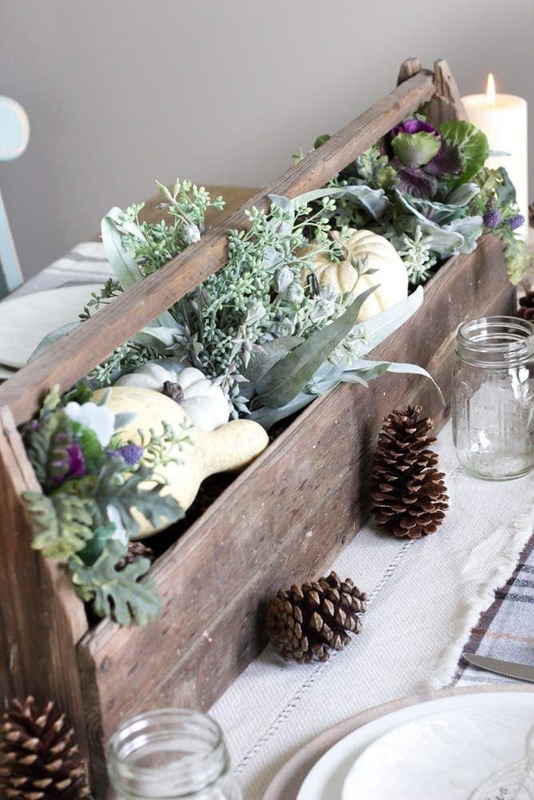 I just stuck three faux fall bouquets inside of it along with some pine cones and plastic gourds to add some fresh color and texture. I whipped these little place card printables too, which you can download here. 5. 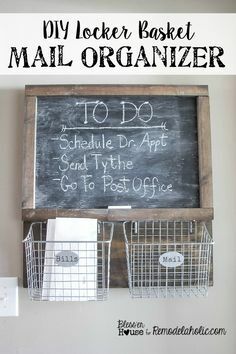 Incorporate items that are sentimental. No decor I buy in the store can ever compare to the sentimental touches around our house, like this old miner’s lamp passed down from my great uncle who worked in the coal mines of West Virginia. And my dad gave me this little cross that he cut out of a wooden beam from my great grandparents’ house. Our living room is our favorite place to crash after a long day. 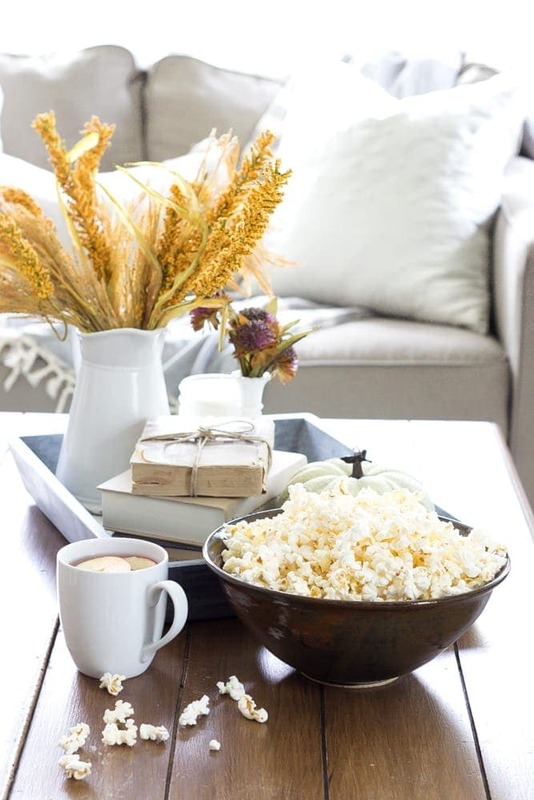 Most Friday nights, we love snuggling up on the couch together and having a movie night. 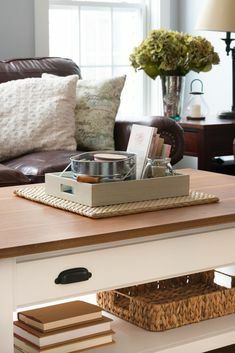 To help corral the clutter we often collect in here, I usually keep a tray on our coffee table for books, remotes, and coasters. And this spot on our sofa is usually where this sleepyhead hangs out. 6. Symmetry is your best friend. I’m never good at leaving well enough alone and am always playing around with our mantel decor. I like starting off the late summer / early fall with neutral colors and bringing out the more vibrant oranges and reds as the weather cools down outside in October and November (which I shared all about in yesterday’s giveaway post). 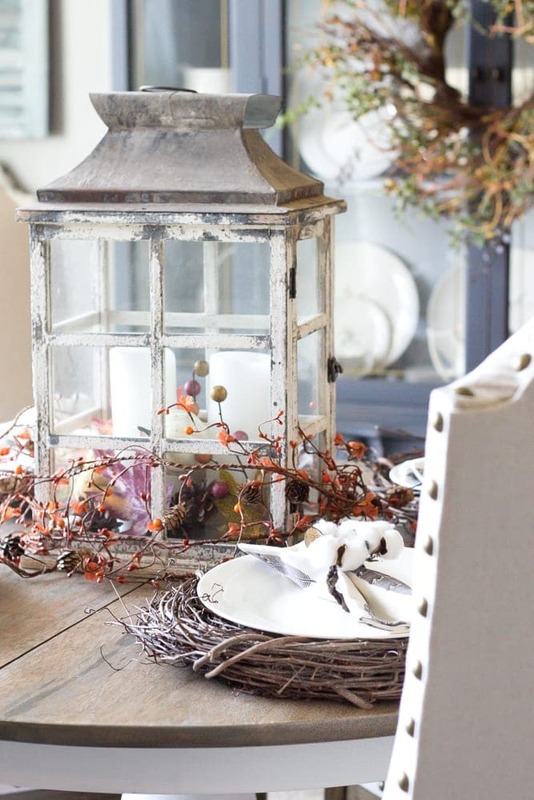 …and adding something with height, a vase or lantern, on either side with seasonal garland in the middle as filler. This is the first fall I’ve been able to decorate our mantel since we moved our TV earlier this year. I gotta say… I don’t hate it. But no matter what your home looks like, whether it’s “magazine-worthy” or has been “well lived in”, love it with all your heart. It’s not the decor that makes a house a home but rather the people in it. 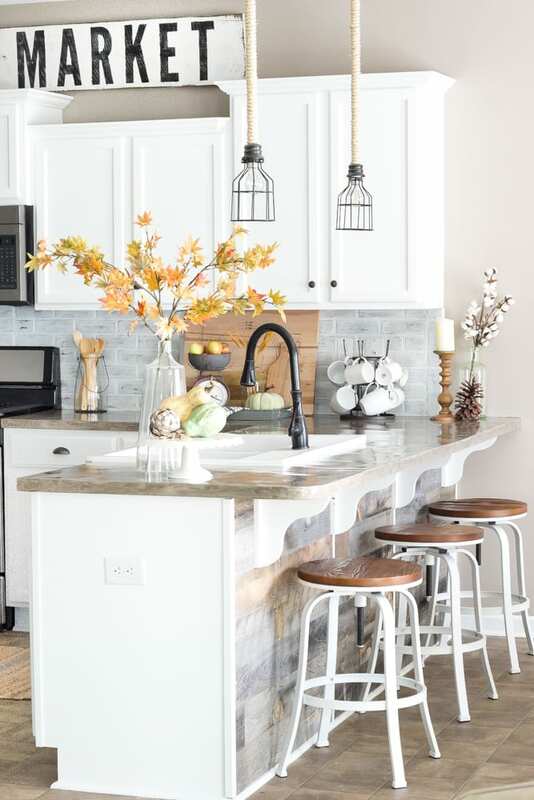 I never want you to walk away from any blogger’s home tour thinking that you’re not enough. You are. 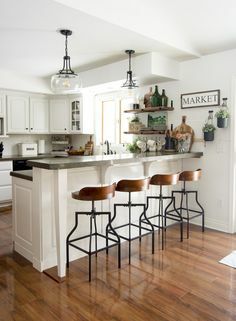 Whether you’re a mom running around carpooling to football practices or a newlywed just starting out in a new home with barely enough income to put food on the table or are in your twilight years with not quite so much energy as you used to have for the DIY projects, I want you to love your home no matter what state its in. If it’s a soft place to land after a long, hard day and a place that revives and comforts your family, that’s what matters most. Love your home and it will love you right back. 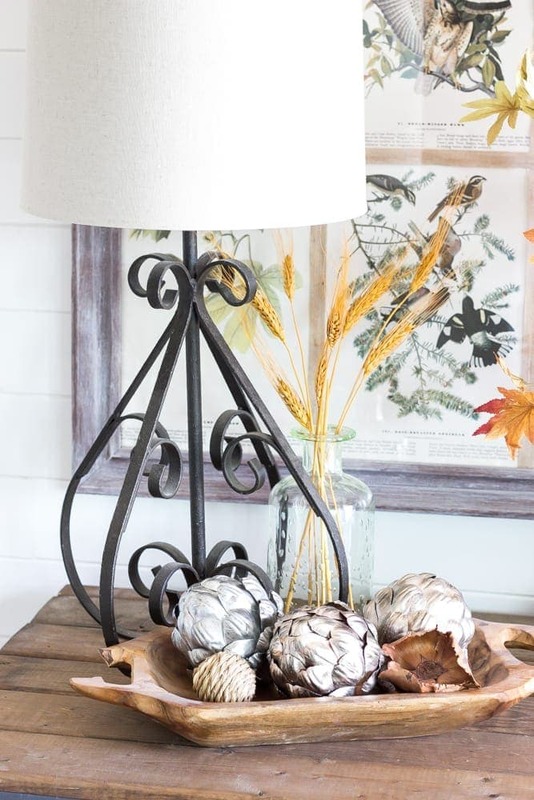 If you’ve started decorating your home for fall, we would love to see it! 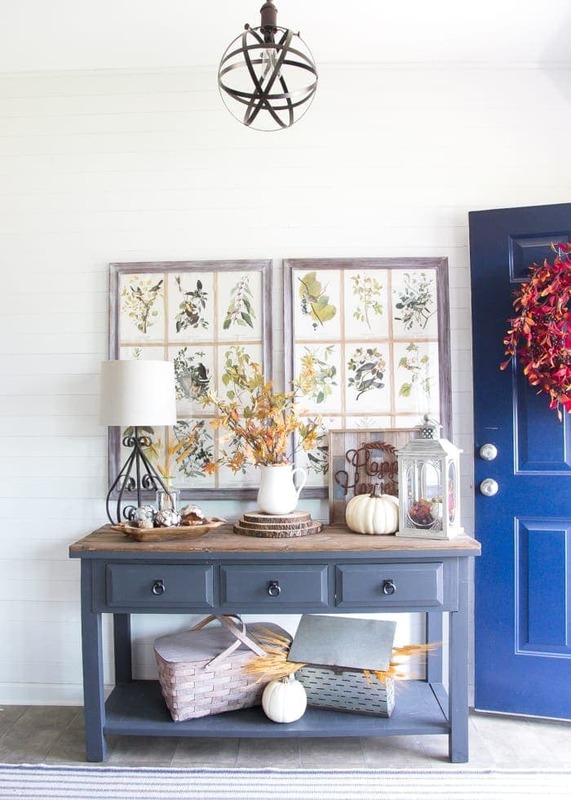 Just share photos of your fall home on Instagram with the hashtag #FallIntoHome and we will feature a few of our favorites on our Instagram feeds. This is just beautiful. I love the lantern on the table. Simple but impressive but more importantly I love Love Love the little cross your Dad made for you. A memory to cherish for a life time. Your home is very cozy and I love it. Thanks Lauren – you’re the best! Aw thank you, Julie! You are so sweet! 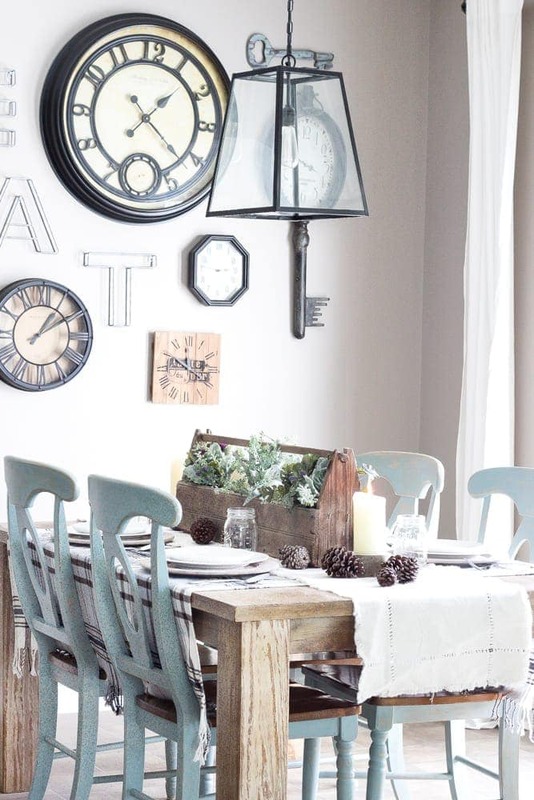 Beautiful home tour Lauren, I love how you incorporate the sentimental pieces into your decor as I’ve seen you do it wonderfully time and again. Sleepyhead looks just fine there. Your home is so pretty but most of all, thank you for encouraging every home owner to love their home even if it’s not quite “magazine worthy”. For most of us, it takes a while to have a home like that. Thank you, Bonnie! If it weren’t for this blog, I’m sure we would not have made anywhere near as much progress as we have. Life happens. 🙂 And the people in our houses matter more than the decor anyway. Thank you SO much, Danielle! I fall in love with your house all over again every time I see it. Thank you SO much, Lanita! You are too sweet! I mean, I think I’m decent at styling, but whenever I see your pics I’m like… geez woman! Come decorate my house! You have that lived-in but magazine worthy look down like daaaaamn! Girrrrl no. Your house and styling is AMAZING!!!!!!!!!!!!!!! I don’t think there are enough exclamation points to fully express how much I lurv lurv lurv your tour. Thank you SO much for having me, Rachel! Even though this reply of mine is crazy stupid late. Haha! I’m DYING to see your kitchen, girl! Your home tour is just beautiful! 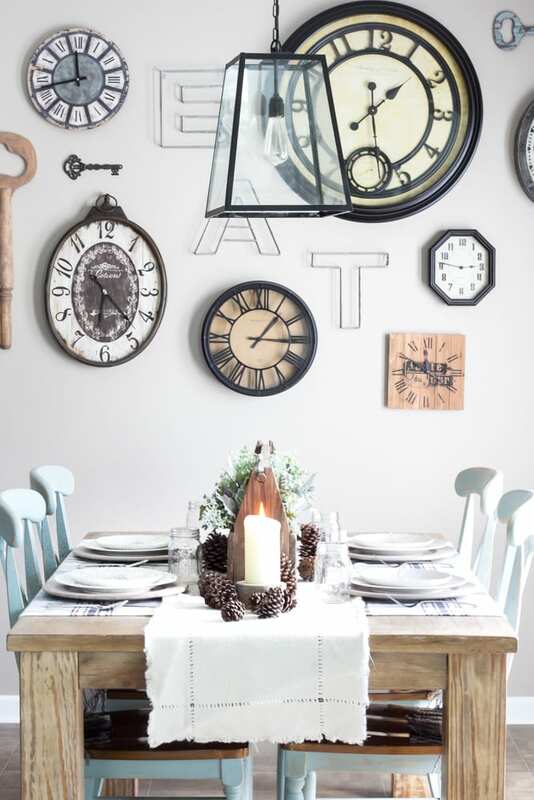 I really love that clock wall-pinning! 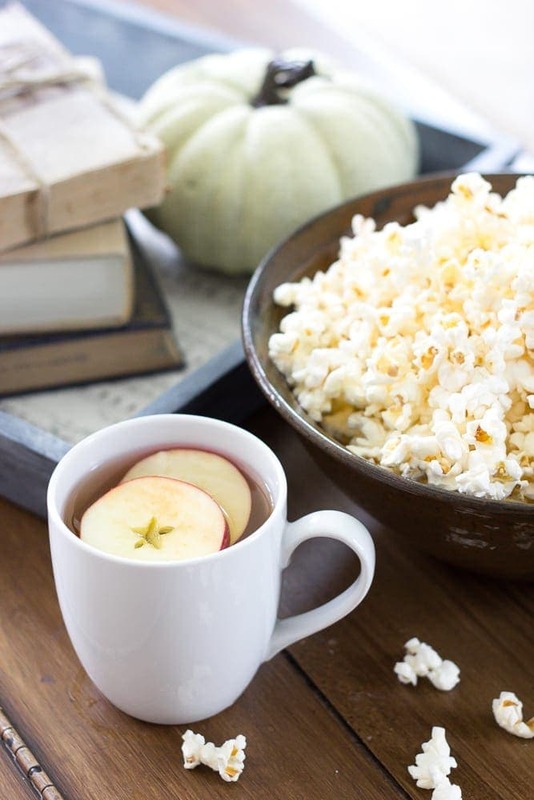 I love your tour, It’s fall perfection! and so funny how all of those pumpkins just followed you home. LOL. Right?! I don’t know how those pumpkins end up in my car. 😉 Thanks, Emily! Lauren, everything looks so beautiful! 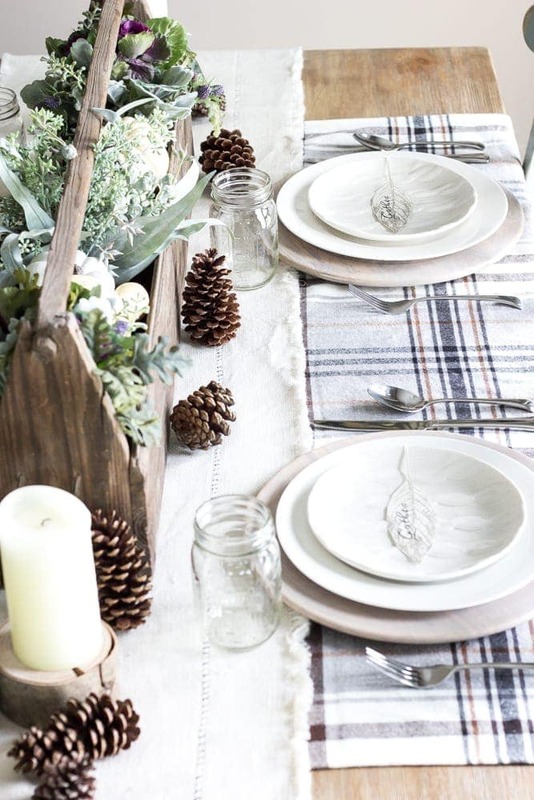 Your kitchen looks so gorgeous dressed up for fall, and I loved your tablescape! Also, Lola looks so cozy and snuggly, she’s adorable! Thank you so much, Nina! LOVED your beautiful tour of your kitchen and entry! Lauren, I love the colors you used they are not the ordinary “fall colors” but you made them all look amazing with your beautiful home. Your home looks lovely, Lauren. I Especially appreciate all the sentimental touches you’ve included in your decor. You have an absolutely gorgeous home! I love every little detail here! The faux flowers and branches fooled me, I’d have said they were real! Thanks so much for sharing at Merry Monday! Always love your home tours, Lauren! Especially your living room! So cozy!! You are so sweet, Kendra! Thank you! Everything looks amazing! 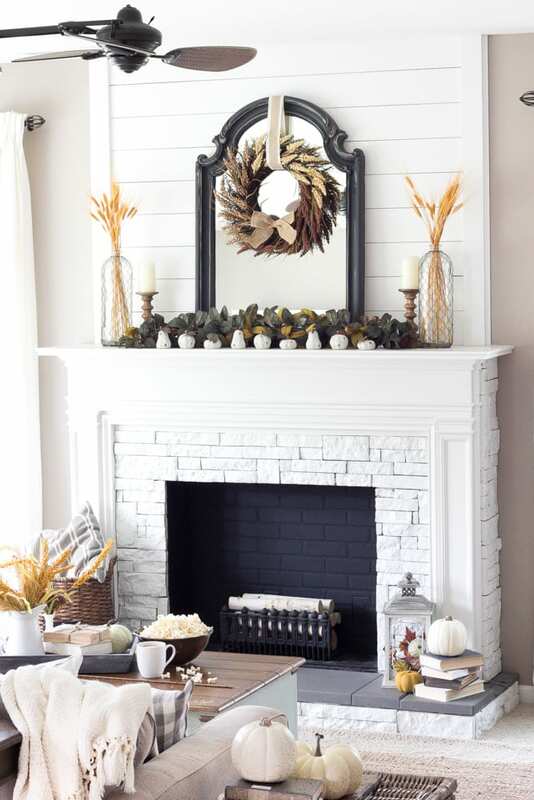 Still absolutely loving your redone fireplace! It looks great in every season! So pretty Lauren! 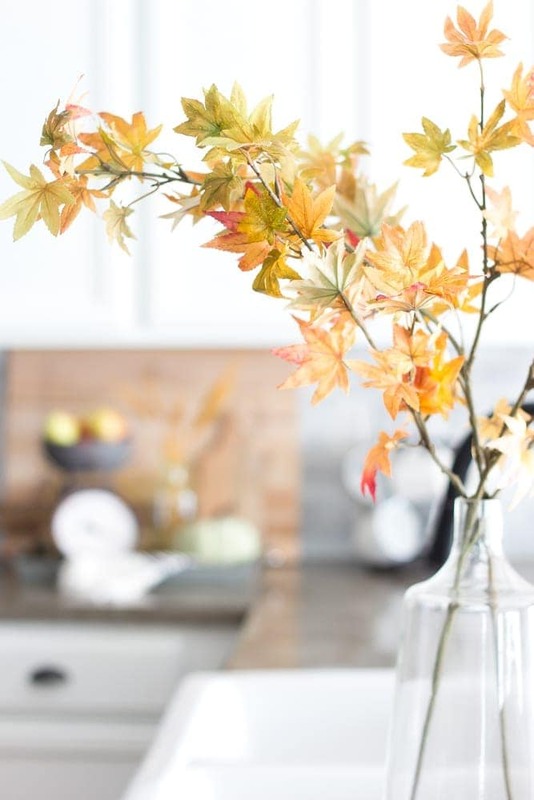 Your home is beautiful dressed for autumn! I have to know where you got your couch! I’m I’m love with it! 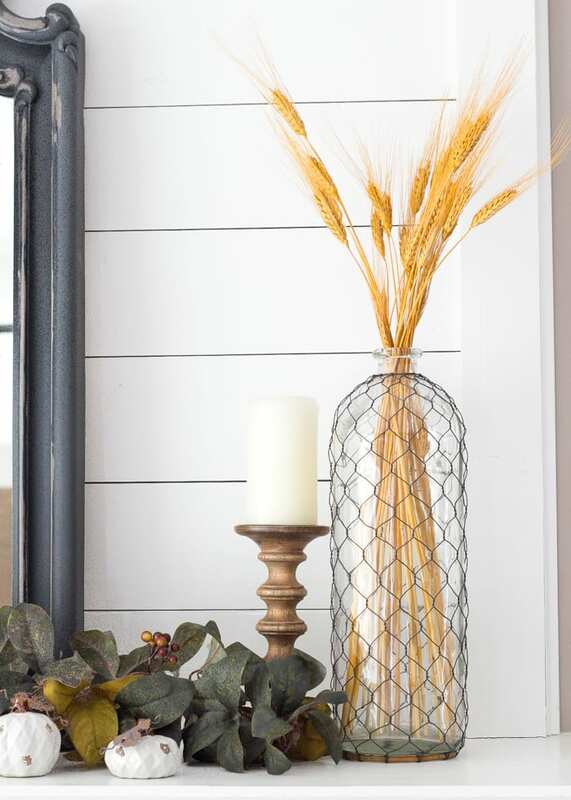 I love everything fall and your decor is perfect. I’m super jealous. Thank you, Katie! We got our couches at Ashley Furniture Homestore a couple of years ago. They’re from their Alenya collection. Thank you, Kala! I actually bought that little green pumpkin at Michael’s last year. They might still have some this season, not sure. Lauren! Wow! Great pics, thanks for sharing. I went neutral fall this year too, it’s fun seeing so many neutral fall palettes. Happy fall to you! 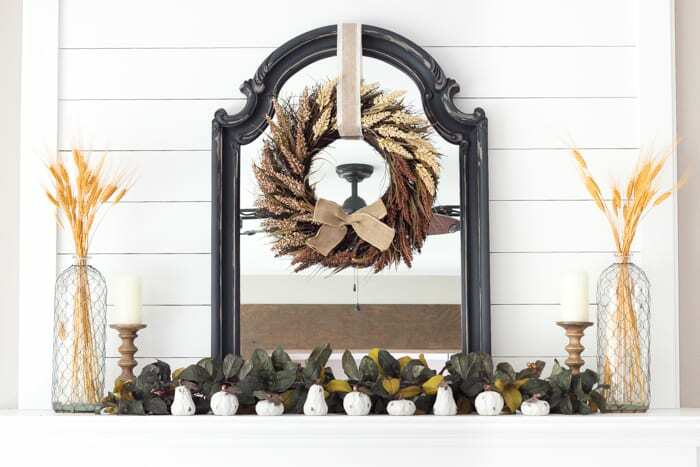 Where did you get the tree bark board set of three on your entry way table? Just fabulous! I know it’s October 21, 2017…but I’m just viewing this hometour for the 1st time! 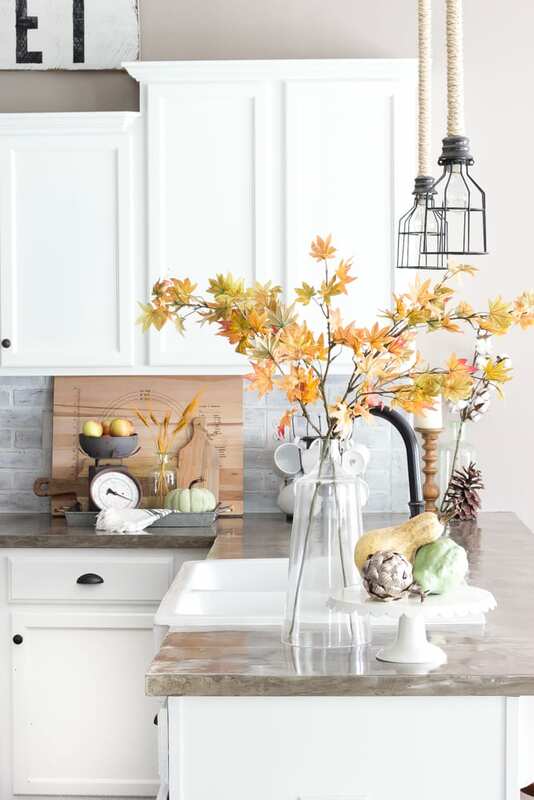 I had to tell you how beautifully natural and inviting your fall home feels. 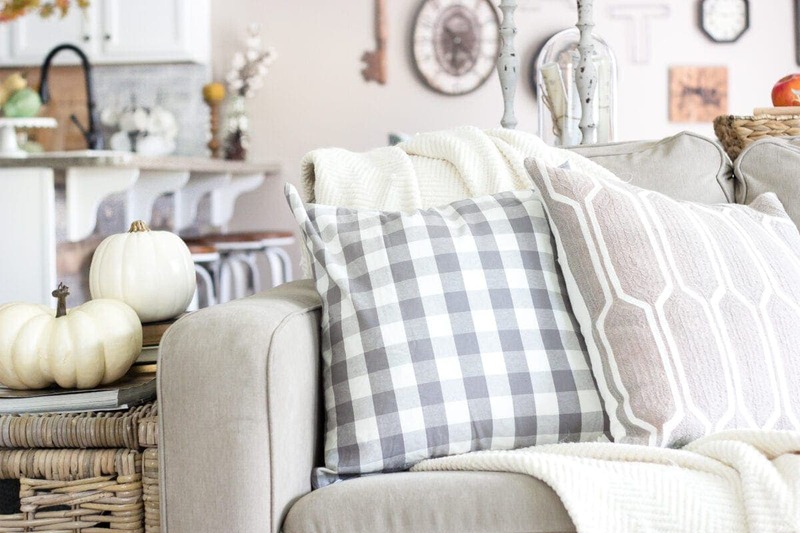 As I looked at each picture (many times over) I felt comfort and coziness…just what I WANT to feel in a lovely autumn styled home. I simply could not leave this post telling how calming and creative my visit to your home has been. Thank you!